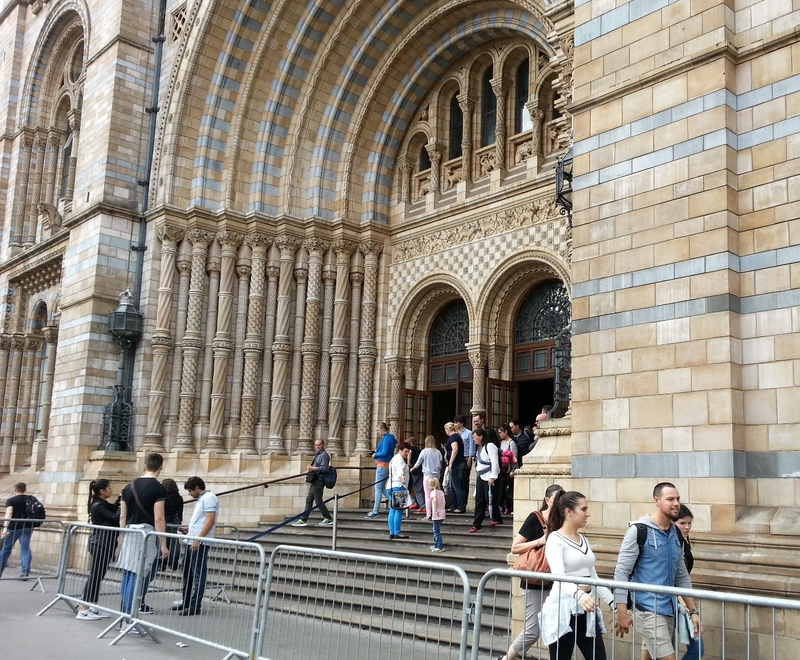 The most amazing experience I had in London was visiting the Natural History Museum. 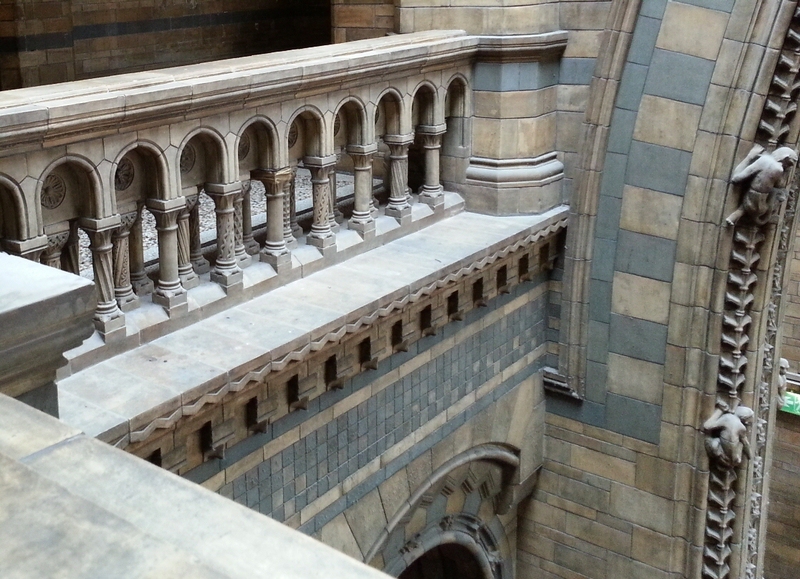 Built in 1881–just a few years after Darwin’s Origin of Species–this extraordinary building (by Alfred Waterhouse) intended to represent a “cathedral of nature.” The columns of this ornate building purposely differ in style, representing the diversity of natural life. 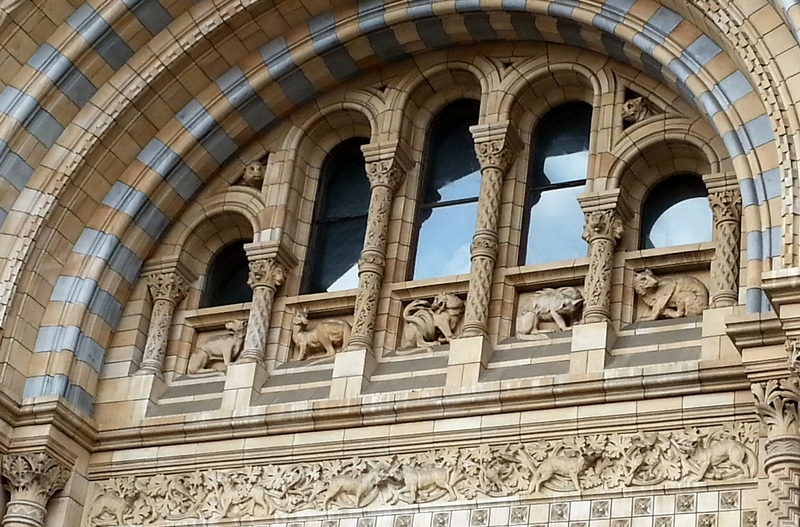 Animals of all different species perch upon the windows. The animals exhibit “natural” behaviors–the lion (above, center) is entwined by a python. Inside the vast edifice (below) amid zig-zagging stairs out of Hogwarts, monkeys climb the arch. 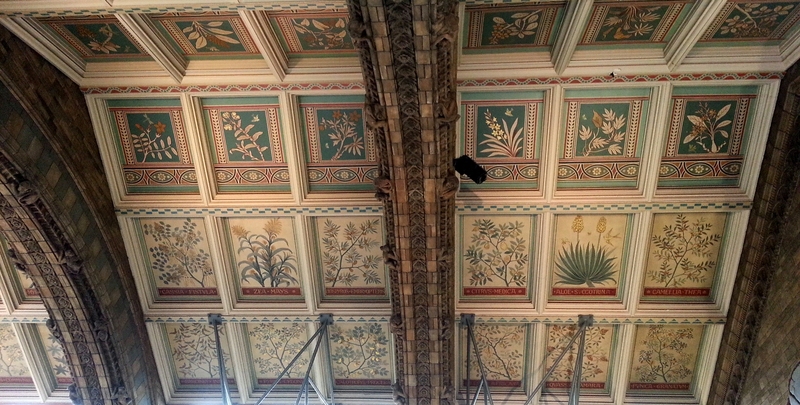 Above all the exhibits and thousands of visitors, the cathedral ceiling represents the most important of life forms: all different kinds of plants. 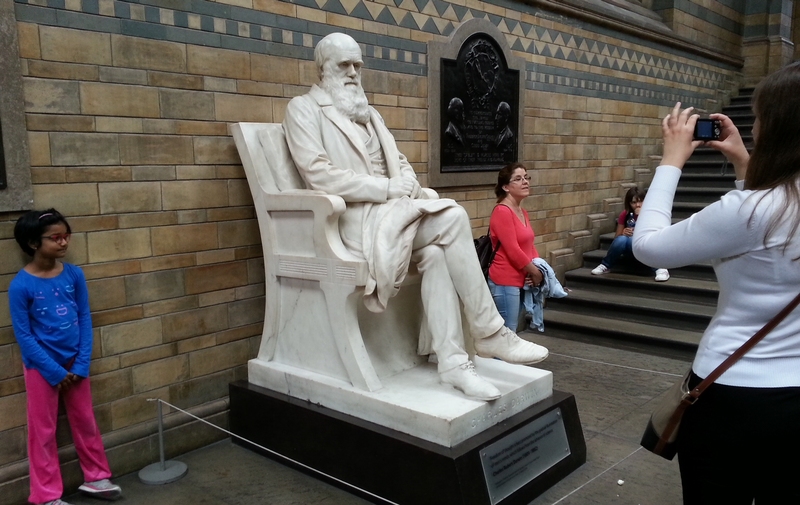 Darwin gets his statue, which visitors crowd to share his photograph. 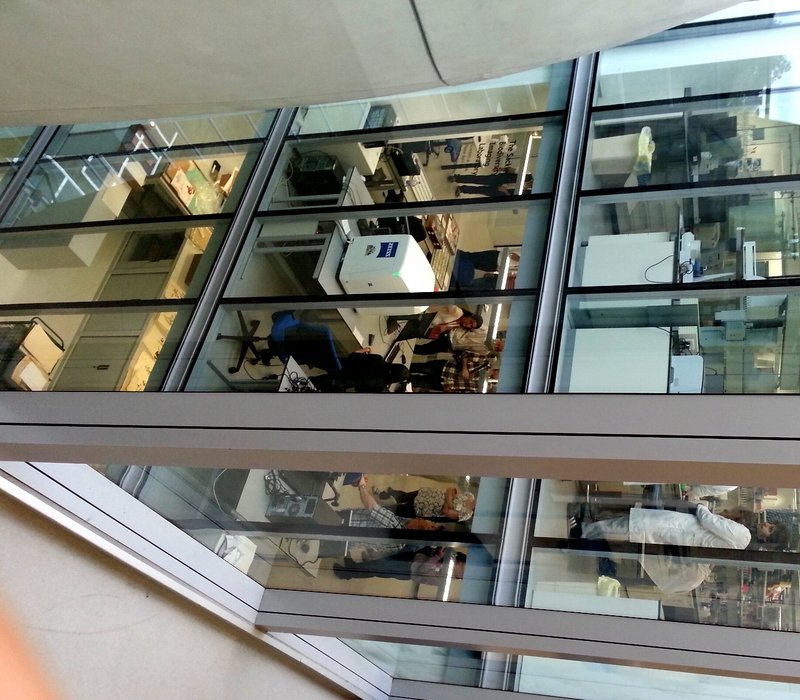 Darwin also gives his name to the Darwin Centre, the super modern laboratory (2009) next door. This laboratory actually faces the visitors’ gallery, where the public can watch live action in three floors of labs, like the scene in Jurassic Park. So what goes on in these labs? Anne Jungblut, Antarctic microbial explorer, gave me a tour. I had met Anne in Antarctica during my adventure there in November. Anne writes a blog about cyanobacteria, on which she is a world-class authority, as well as the school-children’s Microverse project. In Antarctica, we were sampling cold-adapted cyanobacteria. 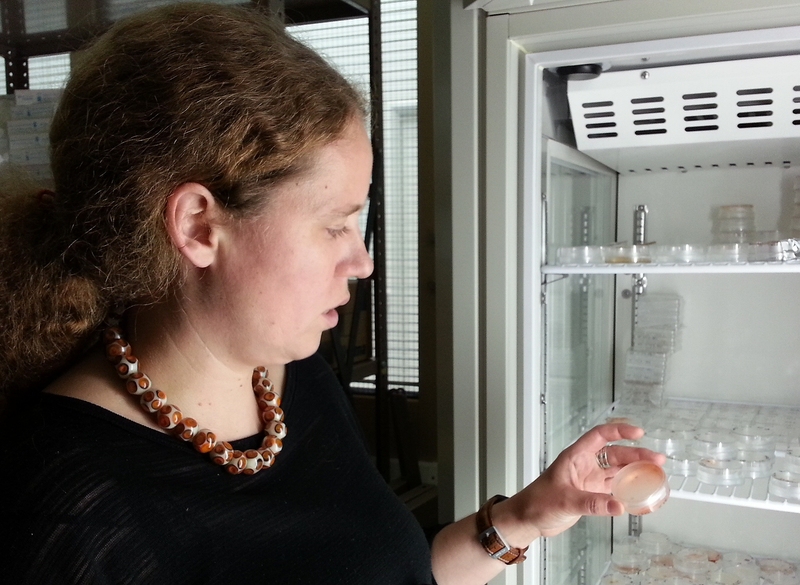 Here, Anne shows some of her samples, which she cultures to study their photosynthesis and phylogeny. Today, phylogeny means DNA. Below, Anne and her student study DNA of cyanobacteria, which she obtains from all parts of the world, from the Dry Valley Lakes to Lake Biwa, Japan. 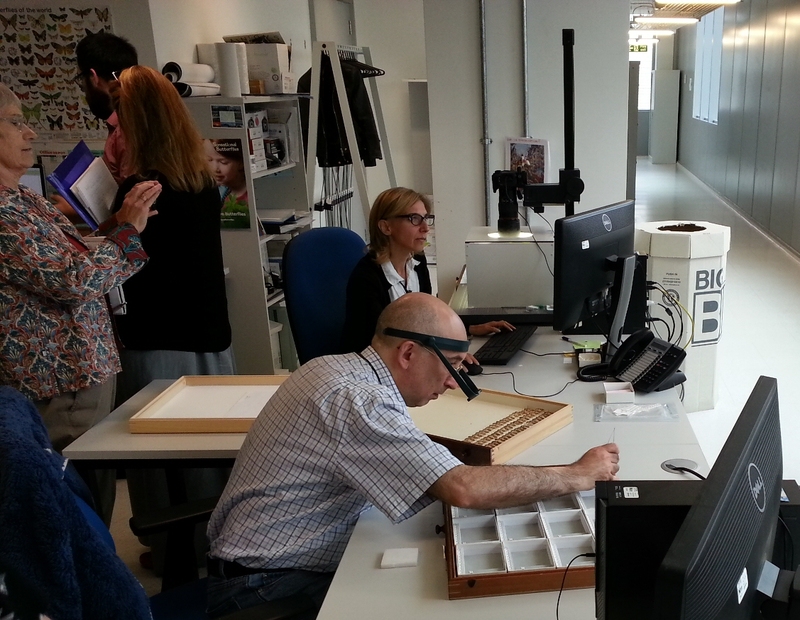 But beyond our modern samples–What about the museum’s 80 million samples collected since the mid nineteenth century? Insects, plants, and animal pelts abound. Some find homes in modern collection boxes; other remain shelved in towering wooden cabinets, even cardboard boxes. Historic expeditions left samples–even William Colbeck’s famous mission to rescue Scott’s ship from Antarctica brought back cyanobacteria, now stored in boxes in the museum. And all these old dried samples have DNA. 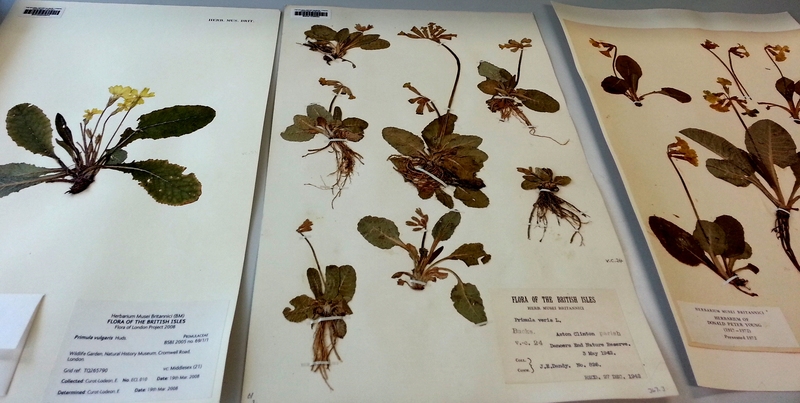 These dried plants, “Flora of the British Isles,” include (middle) Primula veris, the common cowslip, from 1942. How do these cowslips relate to plants of modern Britain? Are they the same species, or different? Can we map how species distributions change over time–and climate change? And what about their microbes? We now know those plants harbor a treasure trove of microbes in their veins, and in the soil trapped in their dried roots. All we need is hands to explore them. I hope to send a Kenyon student there on an Oden fellowship, next summer, to help unearth this treasure. Memories. I visited it regularly when I was a child. Just a trip on the tube or the 73 bus from home. The rock collection alone could take days. Might even have soil DNA. Thanks so much for posting these wonderful photos. Looks like an amazing place. Would like to visit some day. Looks like you are having an amazing summer. Cheers! Between this and the bathroom-bacteria post I’m starting to think you focus on the invisible everywhere. Do you sometimes bump into a signpost while thinking about the molecules in the sidewalk? (ha-ha) Very cool building, though–better than Hogwarts–cause its real! Hope you’re enjoying your summer, Joan.